their history of tragedy, betrayal and murder. they go to hide the truth? dead girl feeds her obsession to find the truth. But will it be enough to lay Genevieve’s ghost to rest?. THE PRICE OF FAME primarily uses two voices to tell the story: documentary film maker Antonia Carlyle who is living in the house in St.Kilda where The Tough Romantics, 80s punk band lived for a few months in the 1980s and where Genevieve James was killed; and a voice from the past, a manuscript transcribed by “missing witness” Joe Walenski from tapes he recorded of an account given by the cab driver in whose arms Genevieve actually died. Walenski is revising the manuscript before handing it over chapter by chapter to Antonia. This has the effect of dragging Genevieve’s story out as well as giving the author time to develop the paranormal aspects to the story. 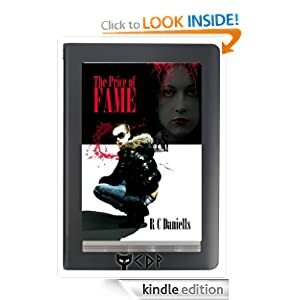 This is a debut paranormal crime novel by Australian author Rowena Cory Daniells. The story is firmly set in St. Kilda, a Melbourne beachside suburb, but for me there wasn’t much Australian about the context, despite the constant reminders of the suburb’s name. It gives a seamier picture of the suburb with prostitutes and rent boys, drug selling and a gang underbelly. Suggestions of paranormal aspects to the story begins with the house hosting a poltergeist, with perhaps the spirit of the dead Genevieve James crying out to be heard, but more supernatural elements are added in during the latter half. Add into that Antonia’s own backstory, with an ex-husband out for revenge. And then individuals from the band re-surface, all wanting to control what Antonia’s documentary, by now to be a film about Genevieve’s murder, will reveal. For me there were too many of these threads, too many red herrings, with the author struggling to bring it all together by the end. The result was an extra long novel, with the length detracting from the quality of the story.